Although having your very own projector can be awesome, selecting the right one can become a cumbersome task. The market seems to be literally flooded with different makes, models and varieties, ultimately leading you to a difficult decision. Which one should you pull the trigger on and purchase? Do you really need to spend hundreds of dollars to find the perfect balance of quality and features? If you’re like most people, you may have checked Amazon first. 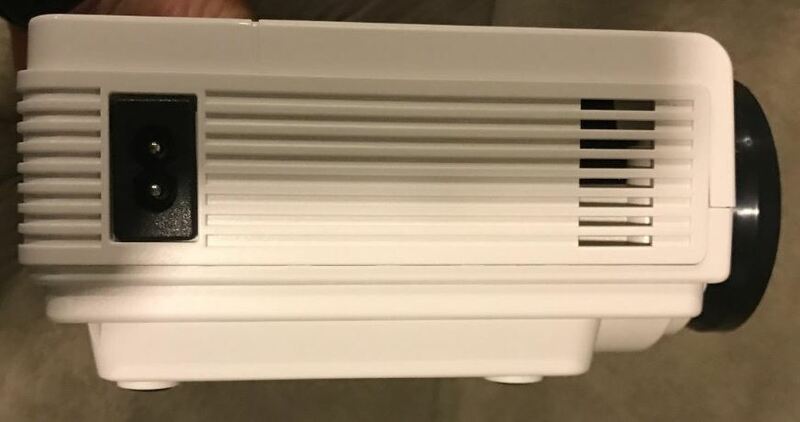 It seems to be the “go-to” place for those looking to purchase a home projector. But it goes without saying – not all are created equal. You’ve got name brands like Optoma and Epson, but a whole slew of less expensive options like Vankyo and DBpower. Many of these less expensive options may initially appear too good to be true. But are they? Take the popular DR. J Professional HI-04 Mini Projector for example. At first glance you’ll likely fall in love with the low price-point, but upon further inspection you’ll also notice some impressive features. Today we’re going to take a close look at the HI-04 and figure out if it’s really worth the investment. Should you go with it or pass and spend a bit more? Let’s find out. 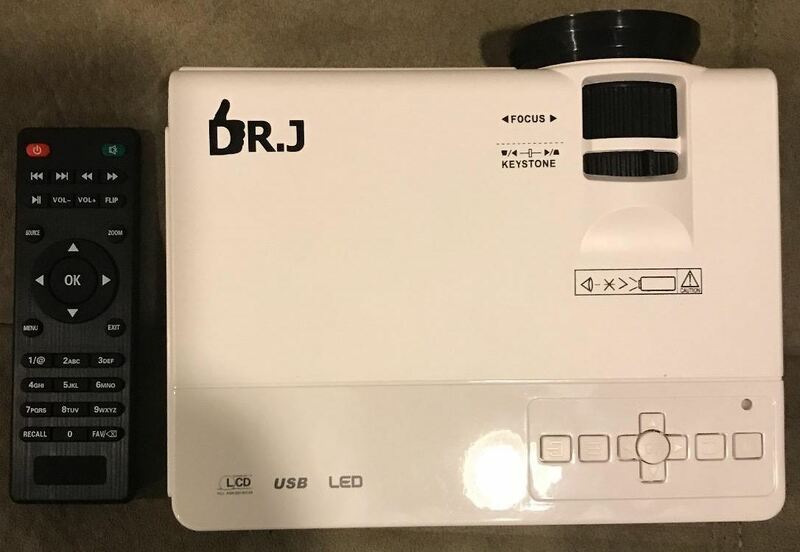 The DR. J HI-04 is labeled as a “mini projector” since it’s much more compact than your average run-of-the-mill projector and built around portability. Weighing in at around 3 lbs. and measuring just 7.8 x 2.7 x 6.02 inches, it’s not exactly “pocket-sized” but much more portable than you may expect. Taking a look at it for the first time, you’ll notice all of the controls are conveniently located on top. There’s basic functions like play/pause, volume, next/previous, and a directional pad. In addition, the keystone adjustment and focus dials are situated right behind the lens on the top-side. On the right side are all of the inputs for connected virtually any kind of media you’d like. 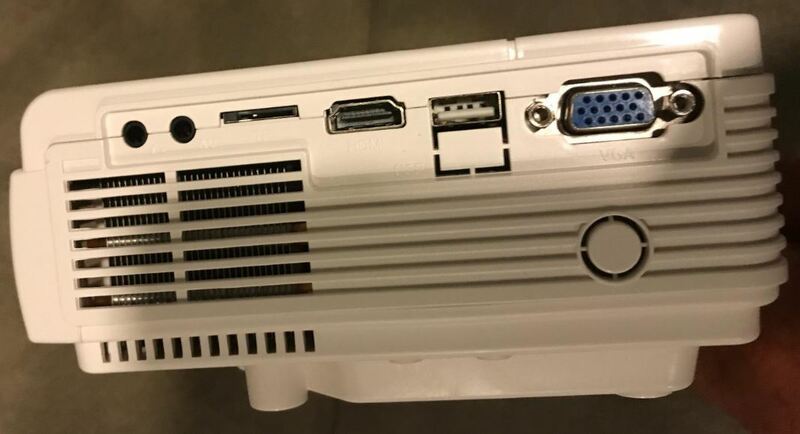 Here you have the VGA, HDMI, USB and auxiliary inputs. Moving to the left side, you’ll see the power cord input and nothing more. The layout is pretty simple, yet it lets you connect just about any device you’d like to project. However, if you’re interested in hooking up your Android or iPhone/iPad, you’ll need to utilize an adapter like this one. With a 840 X 480 native resolution, the DR. J HI-04 doesn’t immediately sound impressive, although it can support 1080p resolutions with some downscaling. This means, while it does indeed support 1080 x 1920 resolutions, it’ll automatically adjust the input resolution to display appropriately at 840 x 480 on the screen. Most watchers won’t even realize that it’s not projecting in full HD since the screen size can be displayed at up to 170 inches. Needless to say, most movies will look wonderful while most power points and text presentations may leave you somewhat dissapointed. To be fair, DR. J does point out that it’s not ideal for business presentations in PPT, Word, Excel, etc. 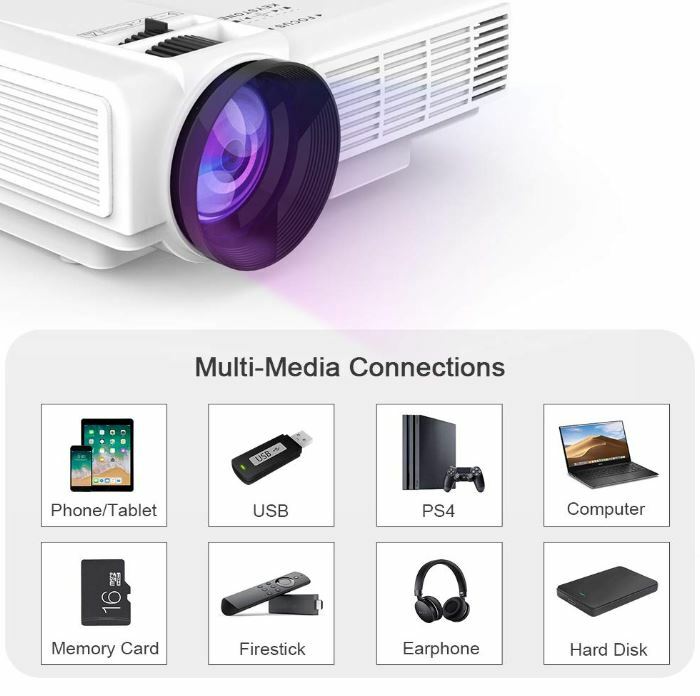 When displaying the projector from intended multimedia sources through HDMI, USB, SD card or VGA, you’ll likely notice a decent amount of brightness coming through. Utilizing an LED light source the HI-04 boasts an impressive brightness of around 2000 lumens with a 2000:1 contrast ratio. On top of that, the screen size is quite decent. By placing the projector around 5 feet away from the screen, it’ll achieve a screen size of around 32 inches. Move it back to 15 feet and you’ll see a 170 inch screen. Once you have it in position for the appropriate screen size you’re going for, it’s quite important to adjust the keystone and focus to an appropriate setting that appears best to you. DR. J claims the LED bulb should last up to 40,000 hours, you can rest assured knowing that it won’t burn out for several years to come. 40,000 hours is a pretty bold claim, but definitely achievable in this day and age of technology. With all of the capabilities of the DR. J HI-04, it’s apparent right from the start that multimedia projection is what it’s intended for. Gaming, movie watching and all-around entertainment is what it excels at. 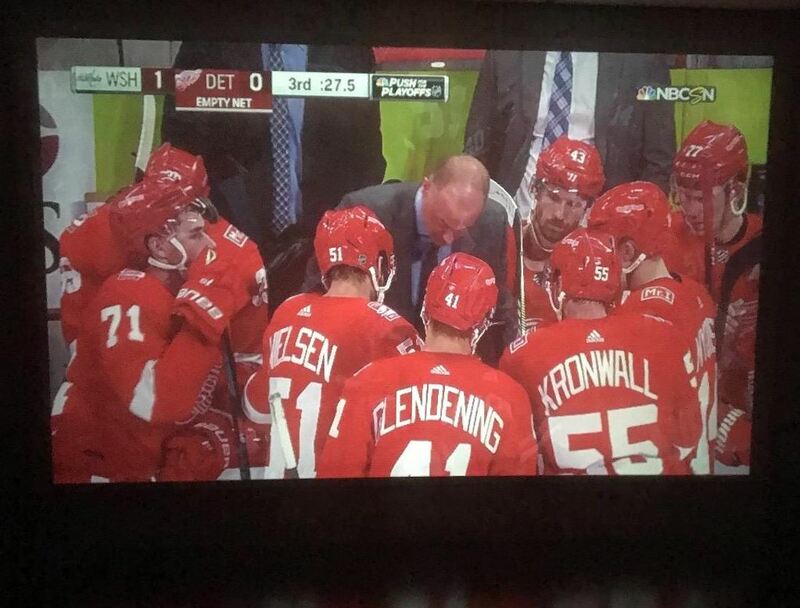 With a multitude of input options, virtually any device can connect in a matter of seconds and display on-screen at a size up to 170 inches. Actual viewing quality may be determined by several factors including ambient lighting, projection distance and input source. But we must say, with ideally dark conditions and a projection size of 100 to 120 inches, you’ll hit the sweet spot. Movies look wonderful and gaming is fantastic. 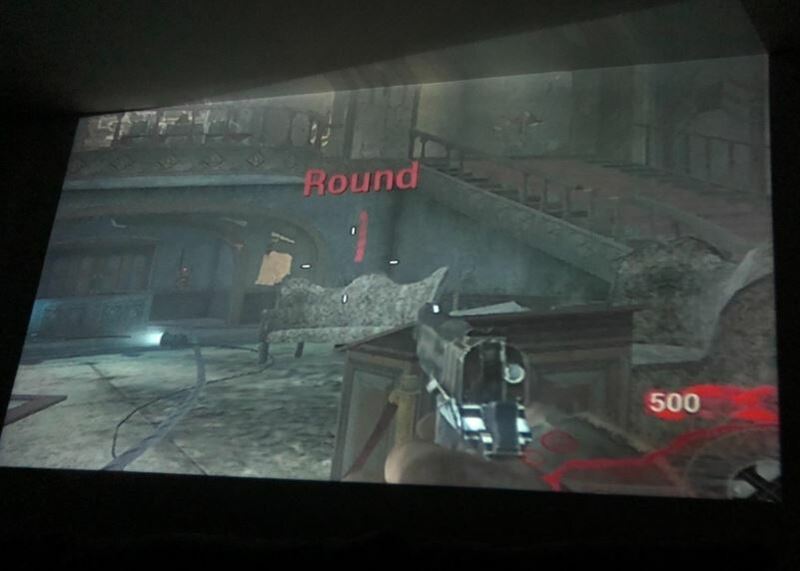 There’s nothing like watching or playing through a projector that is over twice the size of your average TV. Colors seem bright, vibrant and saturated while blacks aren’t quite as deep as a TV, but still acceptable. Built directly into the HI-04 is a stereo speaker, but we must say – it’s not the best. The volume doesn’t emit loud enough and the quality is decent but truly not that impressive. The good thing is that you’re given the option to easily upgrade the sound by plugging in external speakers. This can be achieved through the auxiliary input. Just plug in your favorite speaker, power it up and you’re good to go. We have to say that by taking a moment to connect better speakers, it’ll definitely increase your experience substantially. Sure, the integrated speaker will work for the moment, but if you’re trying to delve into an intense video game or thought-provoking movie, take the time to think about the audio. It goes without saying that electronics (especially projectors) can heat up quickly if given the chance. 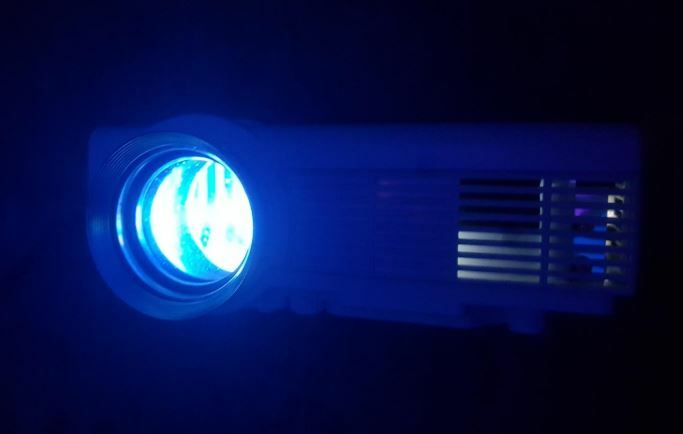 This is why DR. J decided that incorporating two small fans into the case was essential – especially for the extended periods that most people use a projector for. The HI-04 utilizes two small but quiet fans to keep the working temperature at an ideal level by passively intaking air from the rear and exhausting it off to the side. The constant flow of fresh air keeps the internal components from frying-up in the event that you keep the projector operating for extended periods of time. They claim it’s “sound-free” but we’d like to describe it more as a slight “hum” that can be heard if you put your ear next to it. While connecting any multimedia device through HDMI, USB or VGA is simple to do, hooking up your smartphone or tablet does require an adapter. If you’re using an Android device, you’ll want to pick-up a USB Type-C to HDMI adapter. If you’re using an Apple device, you’ll want to pick-up a Lightning to Digital AV adapter. Who’s It For? Who’s It Not For? While you could easily spend close to or over $1000 for a multimedia projector, the DR. J HI-04 is ideal for those looking for acceptable viewing quality in darker environments. The low native resolution isn’t ideal for business presentations as viewing text through it isn’t that great. You’ll want something like the Optoma S343 or the Epson PowerLite L500W. 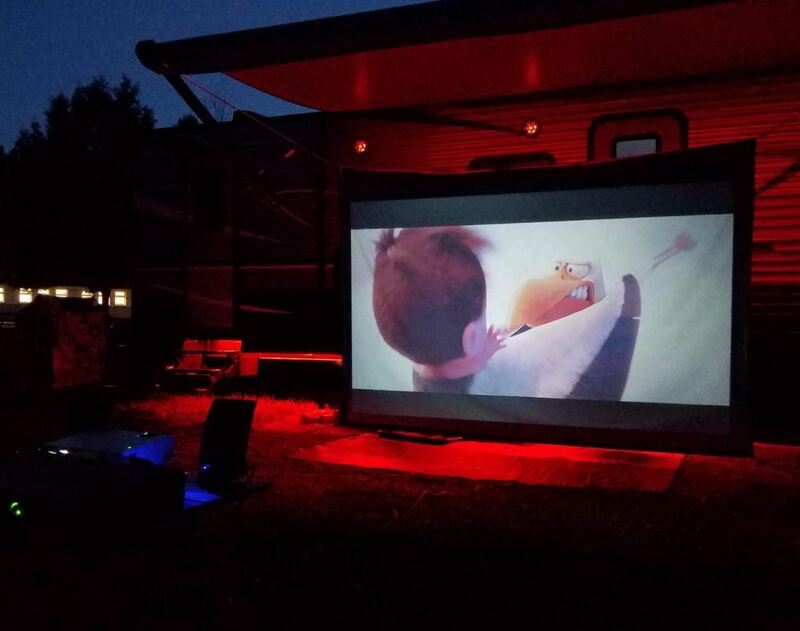 We’d say that the HI-04 is absolutely perfect for those wanting a backyard movie or gaming session or entertainment room “big screen”. Keep in mind that although it supports 1080p, what you’ll be seeing through it isn’t necessarily 1080p; it’s down-scaled to appropriately display. Most users won’t care, however, since you’re getting a big picture experience without the massive price tag you’d otherwise be required to pay. It’s bright, feature-rich and capable of providing the average user with plenty of enjoyment. We highly recommend using it in only dark environments since the display can easily become “white washed” in rooms that have a lot of light leakage. It’ll work outside, but wait until the sun goes down for best results. In addition, the integrated speaker leaves a lot to be desired. Sure, it works, but it’s definitely not loud or clear enough for a real immersive experience. Yes, it has some limitations, but at this price-point, you won’t likely find anything more feature-rich or acceptable than the DR. J Professional HI-04 Mini Projector. It’s small, built well, and most importantly, backed by a generous 3 year (36 month) warranty period with a 100% money-back guarantee. Their customer service seems to be top-notch as they stand behind their products with help and support when you need it the most. Easily contacted via Facebook, Twitter or directly through email (drjprofessional@163.com), DR. J seems to have hit the nail on the head for the perfect balance between portability and overall quality. It’s definitely not “too good to be true”, just understand what you’re buying and how to use it properly. Have you used the HI-04 for yourself? What would you say the pros and cons are? Need some help or just want to give some input? Drop a comment below to get the conversation started!